Here's one of those posts that began as a comment to someone else's blog - Stargrace's MMOQuests in this instance - and then grew out of all proportion. Not done one of those for a while. Stargrace, a very experienced EQ2 player who's not long returned after a while away, has been playing through the new expansion, Kunark Ascending. She's recently had a baby (Congratulations, Stargrace!) and begins her observations with the caveat "I mentioned in my previous post that I don’t have a lot of free time and that what free time I do have is pretty sporadic". I find this somewhat hard to parse. I've played EQ2 most days since the expansion came out. I don't keep a log of how much I play, but throughout November and early December I was in the habit of popping in for an hour or two after I'd done playing GW2 each evening. 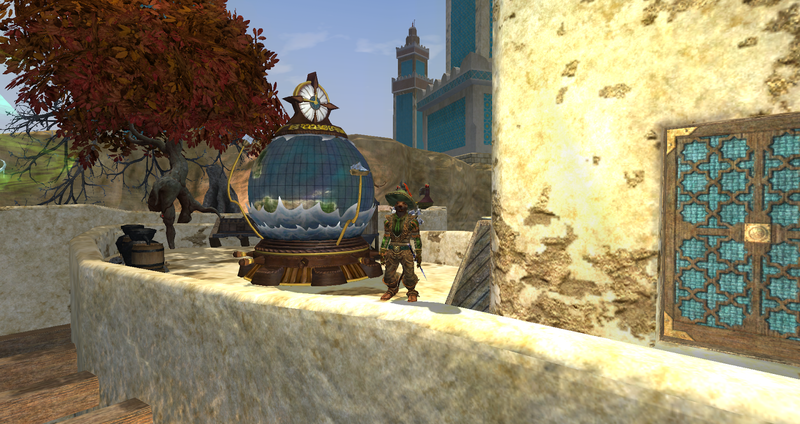 This last couple of weeks I've played two-to-three hour sessions almost every day with a couple of longer runs at weekends, to the point where it would be fair to say that, right now, EQ2 is my main MMO and GW2 my secondary. With this level of involvement I have only just completed the main Signature Adventure questline on a single character. Far from becoming an Ascended, my Berserker hasn't even found where to start the learning process yet. I've been inside maybe three solo dungeons and done them once each, just where the questline requires it. I tried one Advanced Solo dungeon so far, again just once, for fun. I haven't even found where the entrances to the others are. I've done the PQ's (which I love) a few times - maybe eight or nine in total. I've done almost no faction work or timed quests and I'm still finding new side quests I haven't done almost daily. Some of my recent time in EQ2 has been spent on my Stormhold Shadowknight and also on getting my Inquisitor to 100 (currently at 98.5) so it hasn't all been about the new expansion but so far I estimate I've had around 20-25 hours play just doing the above on my main character. That in itself seems like a fair return for the box price (I bought the basic edition as I always do) but as you can see from all the things I haven't finished (or even started) that tally is going to double or treble before I ever begin repeating myself or grinding for alts (if I ever do, which I most likely won't). 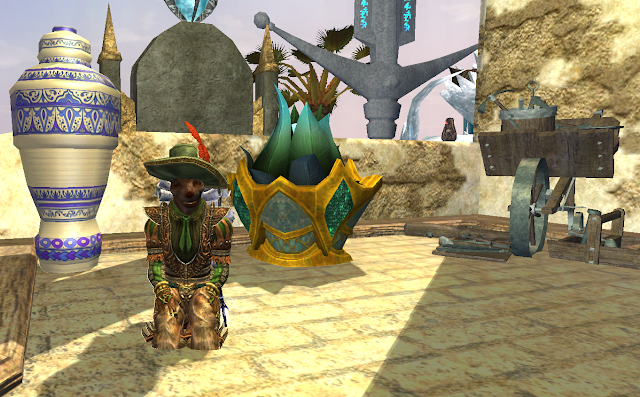 I would guess that, by the standards of non-MMO players, the amount of time I put into playing EQ2 would be considered obsessive at maybe 15 hours a week, especially considering it's not even, really, my main MMO. Stargrace considers her play is constrained by not having a lot of free time. Either she is massively more efficient than I am (highly likely) or her definition of "a lot of free time" is radically different from mine. Much though it differs from my own, however, her point of view and concomitant assessment of the value and worth of the expansion is hardly unusual. The expectations of regular MMO players about what they can reasonably expect from an expansion seem to me to be challenging for game developers, to put it mildly. Every expansion in any MMO I play I seem to hear veteran players talking about having done everything other than the grind repeat parts in a matter of days, let alone weeks. At this point I'm usually still trying to come to terms with the opening stages. 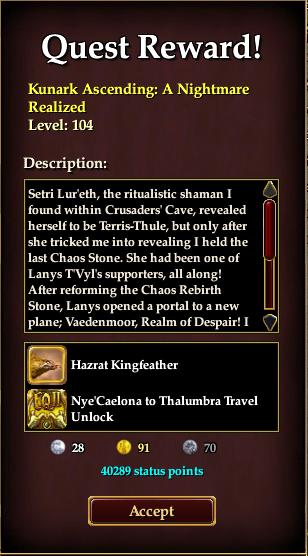 Sticking with EQ2, even the last several, admittedly more modest expansions (when compared to huge, sprawling epics like Rise of Kunark or Echoes of Faydwer) have each taken me a couple of months to complete on a single character. Listening to WoW players talk about the generally well-received Legion expansion it was evident that most had begun to feel they'd done as much as they were interested in doing by about six weeks in. Less than four months after it launched everyone seems to have drifted away again. I have yet to set foot in Legion, even though I added it to my account a couple of months ago, my issue being, ironically, that I don't envisage being able to find enough time to do justice to what's on offer. GW2 certainly made a better fist of keeping players invested in Heart of Thorns, which was de rigeur for most of the year after it dropped and remains, arguably, essential and unavoidable even now. 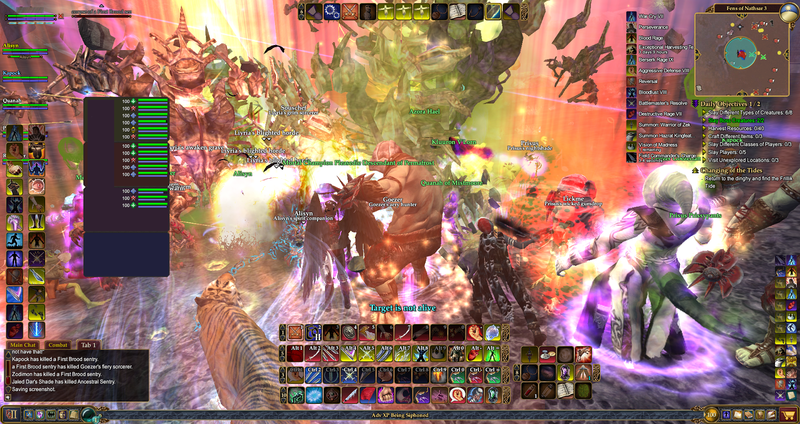 ArenaNet achieved that level of continued relevance, however, at the expense of a great deal of player good will and with a reportedly significant drop in number and income. The endless dissatisfaction of MMO players with the entertainment provided has been a constant since I first began playing. I came across the term "Bored 50s" in my first month of EverQuest, back in November 1999, when the game had barely been out for six months. With a level cap increase Bored 50s soon morphed into Bitter Vets, the term we still use today to describe people who keep playing even though they don't seem to be enjoying it very much. Regular injections of new content, be they free updates or paid expansions, are intended to keep these jaded habitués if not happy then at least docile but they rarely have that effect. Instead they become yet another stick with which to beat the developers for not providing all the entertainment and excitement all the time. As a player who, by and large, rarely even touches "Heroic" or Raid content and therefore, by definition and choice, misses out on a substantial portion of what he's paying for, I would be hard put to think of any MMO expansion I have ever bought that I don't consider to have been good value for money. Indeed, the only one I regret purchasing in almost twenty years is the first Rift expansion, Storm Legion. As is apparent from the posts I've written since it came out, I think the Kunark Ascending expansion is both excellent in its content and extremely good value.Two months after I bought it I have yet to get to what many players, even casual players who mainly solo, would consider the "meat". I imagine I'll still be picking away at it by the time the next (already confirmed) expansion arrives in late 2017. Pretty pictures are all very well but here's the heart of the furnace. I don't think it's that I'm particularly undemanding. As I've often said, I miss the days (the eight or so years, in point of fact) when the main MMOs I played pumped out expansions every six months. 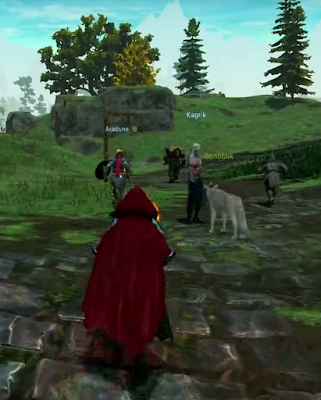 Some of those were so huge they would today be greeted as generously-proportioned new MMOs in their own right. Even the smallest (Legacy of Ykesha springs to mind) would be competitive in present day terms. Even so, even with expectations formed in richer times, when content spewed out of all MMOs in a torrent rather than a trickle, I still find my main problem isn't finding enough new content to keep me amused but finding enough time to do justice to what's on offer. And I play MMOs obsessively by the standards of anyone other than another MMO player. Oh, I tab out and web browse a lot these days. I don't put in my 40+ hours of pure, focused play like I did in the old days. Still, an average week sees me giving my full attention to the screen for 20-25 hours. That's a lot. It's more, in my estimation, than any single game can be expected to provide, week in, week out, all year, this year, next year, in perpetuity. I deal with that by playing many MMOs. How MMO developers are expected to deal with the players who expect to get all their entertainment from a single source - even if that means only all their MMO entertainment...well, that's the problem, isn't it? That's a circle that no-one's been able to square. Hence the stampede towards more forgiving formats: sandboxes and survival sims, where all the developers need to manufacture are the sets and the props; MOBAs and Arenas, where all that's required are rulesets and scorecards; chapter-books, where each release comes as a finished, finite chunk of story with a beginning and, most definitely, an end. All the more praise, then, for those developers who take the hard, thankless path of building on what came before, expanding their vision, integrating their systems, opening their worlds out instead of closing them in. They'll never please everyone. Every expansion will be too hard for some and too easy for others. Someone will have "finished everything" by the end of the first week (first day!) while someone else will be still begging for more time when the pre-events for next year's model begin. No, they'll never please everyone but so long as they keep on keeping on they'll please me. I'm looking forward to next year's expansion round already. Sunday began with a bang. I woke up to find Mrs Bhagpuss already logged in, answering an APB to defend Valley from the surging JQ hordes. I snatched breakfast and joined the defense effort and that was the morning gone. 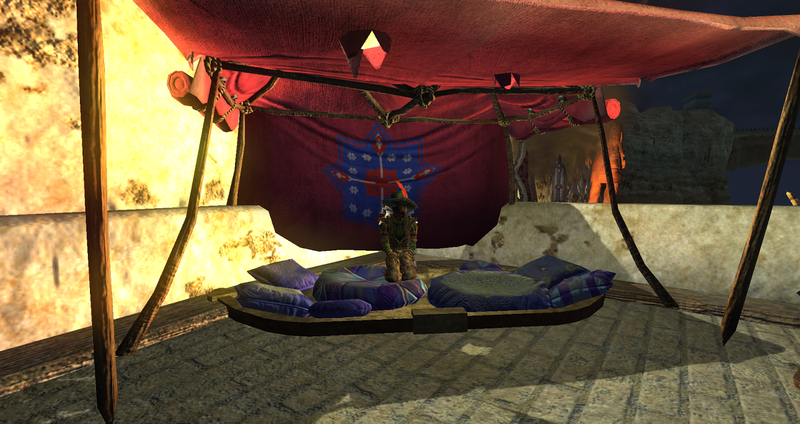 After lunch I pottered for a bit and then moved across to Norrath for what I expected to be a more relaxing, laid-back session. It was entertaining, engaging and enormously satisfying but perhaps not quite as relaxed as all that. 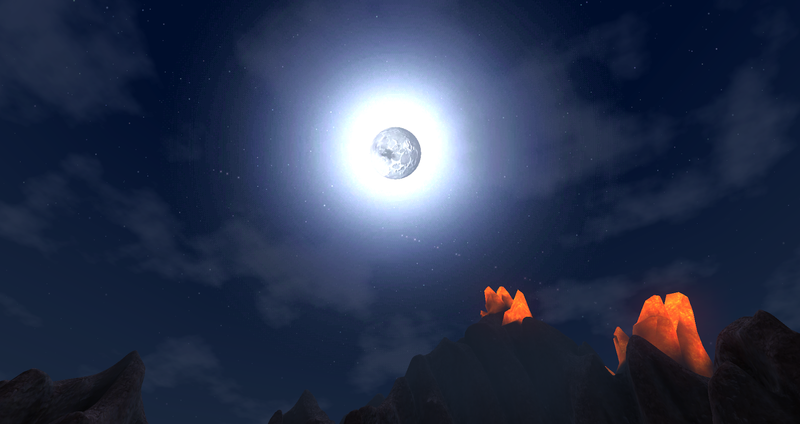 I don't have much that's bad to say about the current EQ2 expansion, Kunark Ascending. So far I've found it to be well paced, intriguing, amusing and fun. Also gorgeous. One thing it isn't, however, is straightforward. Or easy. 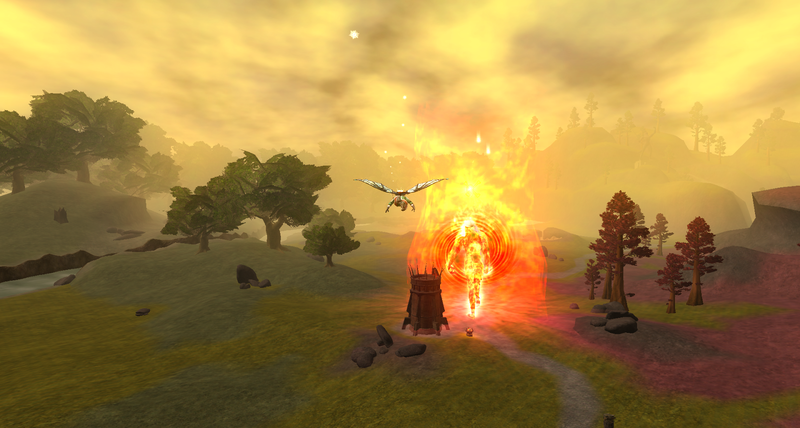 In common with every MMO expansion ever, KA comes with a deal of tinkering to the systems. In this case there's more to it than just the whims and fancies of The New Item Guy. 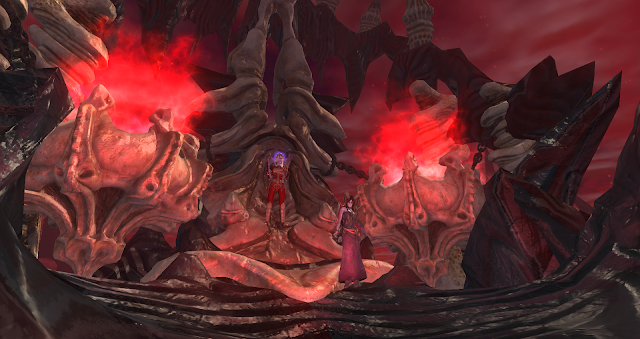 For quite a while the EQ2 team delighted in adding exotic, complex and spectacular effects to gear and weaponry, harking back, no doubt, to the great EverQuest tradition of Things That Proc. Unfortunately, the infrastructure that underpins the game was beginning to struggle under the load of so many ifs, buts and maybes so the current trend favors simple effects and huge boosts to base stats. EQ2 has a lot of stats but it seems there's always room for one more. We got Fervor a while back. Couldn't tell you what that does without looking it up. I checked mine last night and it was zero so it probably doesn't matter much to soloists like me. The big, new must-have for the current expansion is Resolve, one of those "must be this tall to ride" stats so beloved of Heroic Content designers everywhere. Chat is already filled with people citing their qualifications under the new regime - "100 SK LFG 198 Resolve". Again, as far as I can tell, it's a stat solo players can safely ignore, at least for now. That just leaves the other several hundred numbers to consider, then. Okay, I exaggerate. It's only just over three dozen for combat and another eighteen for tradeskills. Granted you have to scroll through three full pages in the in-game window to see them all but what's a little scrolling, eh? I confess I tend to glaze over when trying to compare items. Is this an upgrade to that? Do I need more of this stat or more of the other? It's a common problem, which is why people often link items in chat and throw the discussion open to the wisdom of crowds. Or just beg for help. That's what happened last night. A returning player, stepping into The Obolus Frontier for the first time, was questioning whether his gear might be the reason his Time To Kill was pushing five minutes. General chat has, of late, been exceptionally responsive and helpful, a sure sign that people are enjoying themselves, so instead of being told to L2P or Git Gud a very informative round-table debate on the best way to approach the new content ensued. One particular player took the chair and laid out the precise dos and don'ts, going so far as to link the most easily accessible, cheapest Best In Slot items, with explanations of why and how they were preferred over alternatives. I chipped in with a couple of suggestions of my own and asked a few questions about things that had been puzzling me. It all answered a number of questions and my Berserker will be making some changes to his outfit as a result. The timing wasn't ideal. It was hard to pay full attention to the details because the whole thing kicked off just as I reached the conclusion of the Signature questline. As a result I missed some key dialog and the completely unexpected and quite stunning conclusion almost passed me by altogether. I'll have to pay a lot more attention when I take a second character through it - or else watch it on YouTube if someone's been kind enough to post the finale. In the usual way of things I couldn't really discuss it here anyway because SPOILERS!! Better stick with the stats. It's one hell of a shock ending, though, I'll say that much. For a relaxed, leisurely soloing through the main questline it's recommended that you hit 8k Potency and 100k Ability Mod. You can do that by spending no more than a few hundred platinum on the Broker for a set of Handcrafted "Twark" Gear and accessories. And that's pretty much it. For extensive detail on everything else you might want to know I recommend the invaluable, accurate and authoritative EQ2 Library but the above will get you started nicely. I'd add that if EQ2's hyper-inflationary economy is making you feel even these "cheap" items are insanely over-priced there are several very easy ways you can join the super-rich. A month ago I had less than 50 platinum to my name. Now I have just under 70k. If you have All Access Membership (and if you are buying the current expansion you most probably do) then five of the Loyalty Tokens you earn for your very simple dailies will buy you a Small Bag Of Platinum Coins from the Loyalty section of the store. Each bag contains 500p, more than enough to kit you out in KA basics, head to toe. Alternatively you could buy a three-pack of Experience Vials with your 500 DB Cash monthly stipend, spend an hour or so filling one up and sell it on the Broker for the going rate of around 30,000 plat. 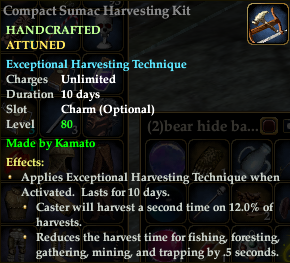 And if you are planning on doing the KA crafting line as well as the Adventure one, do the crafting quests first. They require no special gear and half way through you get the plant I mentioned yesterday which will give you an income stream of several thousand platinum a day for the foreseeable future. All of this begs the question, which was raised in the discussion in game yesterday, of whether a new expansion should require players to prepare in advance, whether by doing old content, saving money or buying gear. The answer is it doesn't. As I said, I only learned the above as I was finishing the very final stages of the Signature questline. I did the entire thing wearing the gear I had on the day it launched and the upgrades I acquired from the KA quests and drops themselves. Even by the end I only had around 5.5k Potency and 75k Ability Mod. There were very short periods when things were genuinely difficult, but none of those were out of line with the difficulty I have experienced in previous expansions. A little lateral thinking, a single session doing some side-quests and swapping some already-acquired items around and those speed bumps soon vanished in the rear-view mirror. What I had done coming in, however, was complete the whole of the Signature line from the previous expansion, Terrors of Thalumbra. I can confirm that, without question, as a Berserker, the gear from the previous expansion is entirely sufficient to get you rolling in the current one. And that, I think, is entirely reasonable. Just behind and to the right of the dapper young gaucho in the cluttered screenshot at the head of this post you'll see a curious green object in an ornate container. Were you able to examine it closely you'd discover it to be a plant. No, not just a plant - an entire garden. 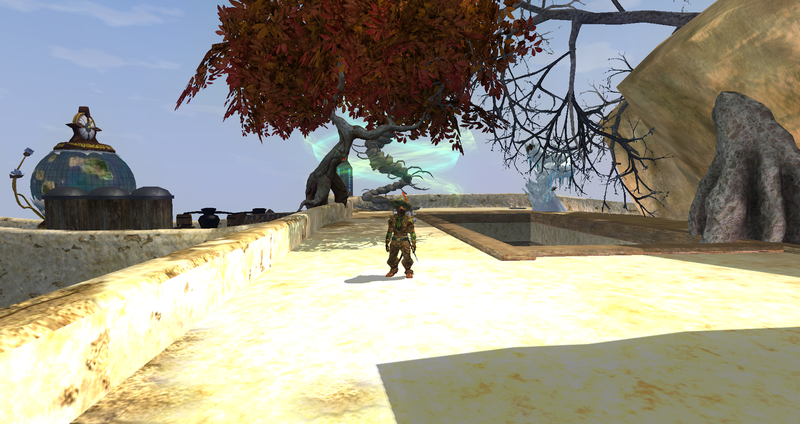 The Obulus Frontier Garden is one of the rewards you get from doing the extensive crafting questline in EQ2's Kunark Ascending expansion. It's not the final reward, just a stage along the way, but it's a very useful and welcome one indeed. Every day the owner of this rather unprepossessing green plant gets to harvest a rare material from its waxy leaves. As I understand it, the rare can be any of those required for the current highest-level recipes, all of which, in this expansion, derive from the same source, the Shadeweave Plant. 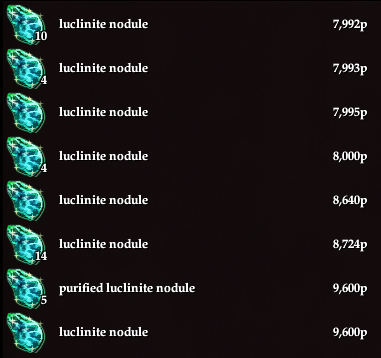 So far the prize I've plucked from the pot every day has been a Luclinite Nodule, the rare for jewelcrafting. The quest explicitly explains that the plant extracts and excretes harmful Luclinite from the soil around it in much the same way an oyster excretes a pearl. That might be fanciful but it certainly makes more sense than a plant spitting out a chunk of ore or an animal pelt. 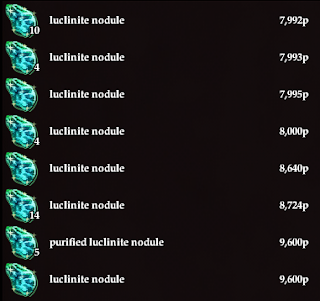 As it happens I don't have a maxed-out Jewelcrafter capable of taking advantage of this daily bounty but so long as the Nodule is selling on the broker for almost 8,000 Platinum a pop then I'm not too concerned about that. 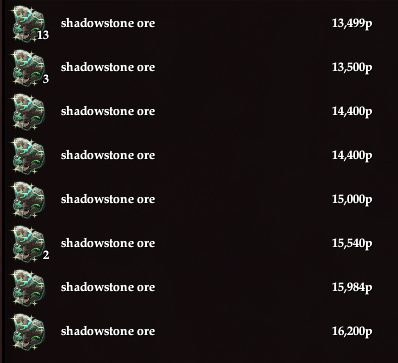 If needs be I can sell my Luclinite and buy the Shadowstone Ore my weaponsmith uses with the proceeds, although I'd be the loser on that deal, what with Shadowstone trading at a heavy premium over Luclinite. But this isn't intended as a commentary on the vagaries of the Norrathian economy. It's a response to something Telwyn at GamingSF posted recently. Most MMORPGs I've played have had some form of gathering and as Telwyn observes gathering is ideal for when you want something relaxing and "not too mentally taxing". or a glowing shrub and clicking. GW2 follows that exact model. Throw in a pleasing animation and a couple of sound effects and it's surprising how calming it can be. ArenaNet, relying heavily as they do on their cash shop to keep food on the table and trainers on the kids' feet, gussy their gathering offer up with a variety of flash-bang-wallop harvesting tools. I have never wasted my money on any of them but I have often shared the misery fun of all that fizzing, whirring and yelping as people with more money than taste or patience let them loose on the node I'm currently attending. We share nodes because GW2 enjoys non-competetive gathering. Every player gets to harvest every node. Vanguard, which had an excellent Gathering offer, went a stage further with a group gathering system that allowed players to combine their efforts for higher yields and a greater chance at rares. Vanguard also had a separate paper doll for harvesting clothes and tools, encouraging players to dress their Rakis and Goblins up like little peasants to till the land. Then, Vanguard had separate paper dolls for crafting, diplomacy and adventuring, too. It was a dressing up game par excellence. 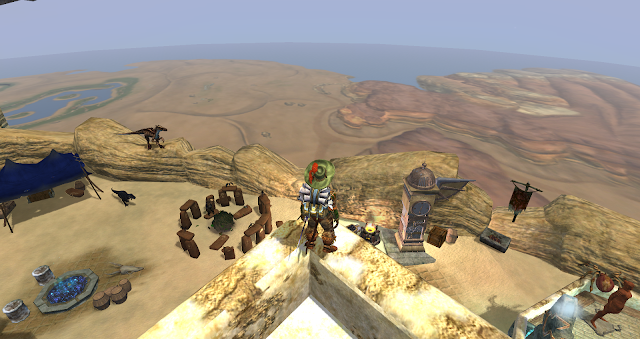 EQ2 has a range of gathering tools and accoutrements of its own, as well as some Alternative Advancement (AA) skills. 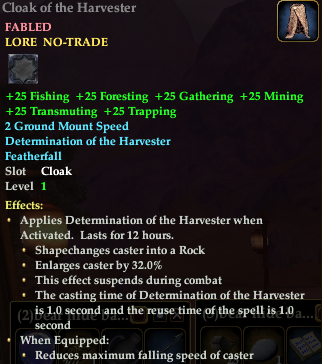 Mostly, they speed up the rate at which the gathering bar moves and increase the amount of materials you receive. Once you've become habituated to gathering with such advantages the basic skills of a fresh character seem sluggish in the extreme. 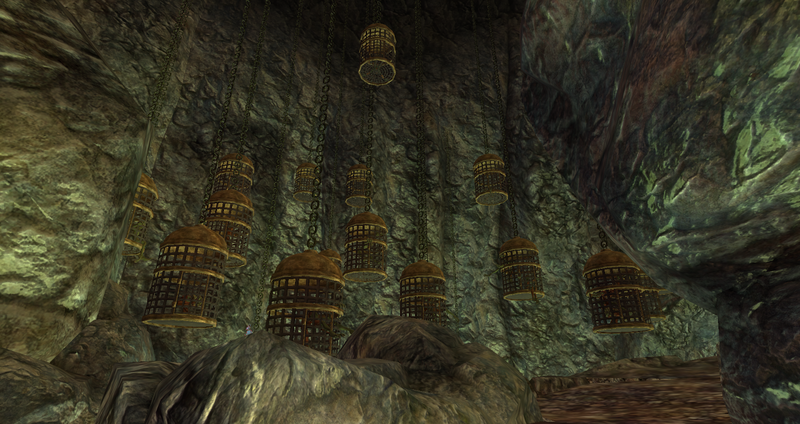 EQ2 also has something a lot rarer in the gathering sphere than mere tools and skills. As mentioned earlier it has gathering quests. It may be that other MMOs have them - I'm certain many have the odd few scattered around and, of course, plenty of regular quests require you to gather things along the way - but I struggle to think of any other MMO that has something that could, albeit not entirely without a little irony, be described to as a "Gathering Epic". That, though, is how many players refer to the very lengthy sequence of quests offered by the exceptionally annoying brat Qho Augren. If you take him on at the earliest opportunity, this questline will span most of your leveling game, taking you from five to ninety-five as well as into frequent fantasies of child-murder. Personally I never found him that annoying. I've done the entire sequence once and most of it three or four times. It's a great way to pass a wet Sunday afternoon in March. 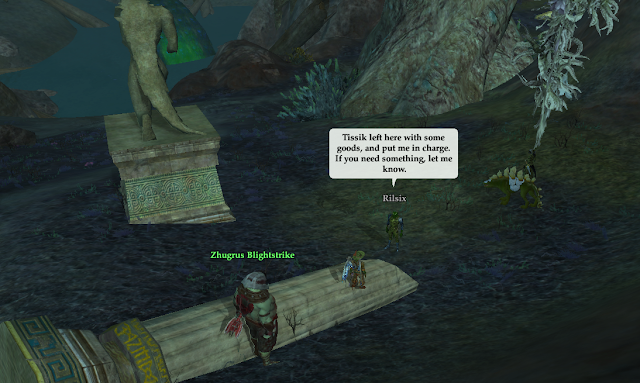 It's not, by any means, the only gathering quest EQ2 has to offer either although I still think there could be more. In fact, I think there could be a whole MMO based primarily around Gathering. Particularly if the developers were to roll in Gathering's sister activity, Collecting. Imagine an MMO set in a detailed virtual world, where instead of killing monsters, fighting demons or slaying dragons your character set out to acquire rare specimens, funding herself along the way by gathering more common yet saleable stock for various merchants and powers. ...perhaps a little like Gathering is today. And then some bright developer would come up with the idea of adding Combat Gear. And skills. And some quests, too, because the minority of players who like combat pay their Sub or their Premium Membership too, don't they? I see where this is going. Oh, well. I'd play it anyway. What to do when you have plenty of ideas for posts but no time? Picture Post! The more I've been playing EQ2 of late, the more I've come to realize just how much I love the housing there. Even more specifically, how much I love my houses. To be even more specific still, my Maj'Dul Mansion. It's stuffed to bursting with mementos, trophies and keepsakes, all of which stir up just the same nostalgic memories I'd get if I went up into my attic and began rootling through the boxes there. And then there's the effort I put in to gain the faction to buy the deed in the first place. It was my first big house and getting it meant a lot at the time. It's also my first and only "breakout" house. Placing the teleport pads to open up the roofs and alleys of Maj'Dul was one of the more memorable moments of my MMO career. It's impossible to do justice to EQ2's housing in screenshots. You really need the full 360 degree field of view. I have a vague project in mind to make a video of my ratonga wandering through the rooms, recording his recollections of what he has and how he got it. Probably never going to find the time. Or the disk space. Until then I'll just settle for coming back after each adventure for a sound night's sleep under the desert stars. Home is where the heart is and mine's in Maj'Dul. Visionary Realms, the developer behind Brad McQuaid's "Pantheon: Rise of the Fallen", has a predilection for releasing very, very long live streams, during which various developers talk at great length and in considerable detail about the systems and concepts behind the game. This is a form of publicity that has its merits but for anyone with a less-than obsessive interest in the project it can be counterproductive. It's true that watching other people play video games has become a thing in the second decade of the twenty-first century so there's probably some demographic that actively looks forward to a full evening of watching a bearded guy in a beanie hat talk over muddy footage of a pre-alpha but its a demographic that doesn't include me. That doesn't mean to say I'm not interested. I'm very interested. It's more that I just want the bullet point version. Amazingly, someone has thought of that. And not just thought about it but done something to make it happen. Thanks to the invaluable MassivelyOP my attention was drawn to this google docs summary. It's a fantastic list of topics hyperlinked to the exact point in the stream where those subjects are discussed. I spent half an hour flipping through it and learned a lot. And what I learned I liked. CohhCarnage, hosting the stream, asks the VR devs a number of questions put to him by the viewers of his channel. Sometimes he answers from his own perspective as someone who's played the game as it stands right now. There's a wealth of detail but the key takeaway comes in his reply to the simple question "How close to EverQuest is this?" to which he replies "...in my mind it's what EQ2 should have been...EverQuest One with a little bit of Vanguard and some modern mechanics". And isn't it just? You can see that in every second of footage. It looks like Vanguard, it plays like EQ and the footage of the Perception System demonstrates that everything doesn't have to be exactly the way it would have been a decade ago, let alone all the way back in 1999. What's more, if you scroll down that Google Docs page to the summaries and screenshots after the links you can see the similarities go way, way further than skin-deep. When Pantheon was announced I think it's fair to say we were all skeptical. No, let's be fair - the most optimistic among us were skeptical - the rest varied from derisive to outraged. When the Kickstarter crashed and burned you couldn't have taken bets on Pantheon ever appearing in any form, not at a thousand to one odds. And yet here it is. Perhaps the reason Visionary Realms are so keen to use lengthy livestreams of actual gameplay as a promotional tool is that this way no-one can be in any doubt that the game really does exist. Look, there it is. Those are people actually playing it. And having a good time. Compare that to the EQNext "gameplay" footage that some people at the time seemed to think was almost too good to be true. Irony, much? So it seems Brad is back for real this time. After all the debates and discussions over just how much input and influence he ever had in making EQ into the classic it became, there can't be any doubt any more, can there? EverQuest, Vanguard and Pantheon - separated at birth. The common factor would be Brad McQuaid. Whatever it is he does he's doing it again. Kind estimates would suggest we won't see Pantheon hit anything you'd call a "launch", whatever that means these days, until 2018 at the earliest. I will be sixty in 2018. God help me. I was forty when I picked up EQ at whatever that long-forgotten, long-since closed down video game store was called. Twenty years on, will I want to start over again, playing an MMO that looks to all intents and purposes to be the same damn game I started with? You'd think not but every one of those streams I dip into the more I want to say yes, I probably do. Even the lore, which on the initial announcement underwhelmed me to the point that I couldn't find my whelm at all, is beginning to grow on me. This explanation of why the Gnome character in the party looks like an android kabuki player had me thinking "I want to play a Gnome". And yes, I know I always want to play a gnome, but now I want to play that gnome. There were other things in the stream that made me feel more positive about the direction development is taking. The reply to the question "Is this game able to be played by a soloer?" was immensely reassuring, for example. "On the whole we're a group-centric game but we will never discourage soloing" seems to me to hit exactly the right tone. There's also a great moment where Brad talks about the game going into wider access next year and a PR person comes in behind him to say "When Brad says we hope to do something for Q1/Q2 it's really, really important to note that's a goal - it's not set in stone". You tell him, PR Guy! If that alpha does arrive in the first six months of next year it will be for "pre-alpha pledgers only" (PR Guy again). I'm glad he clarified that because I was idly considering pledging if it would get me into the game early. It looks entirely playable already and after all, who knows if any of us will be around when Pantheon actually releases? We're none of us getting any younger. No, I can wait. But I'll wait with interest. And if there's a beta announcement sometime next year then I'm not ruling anything out. 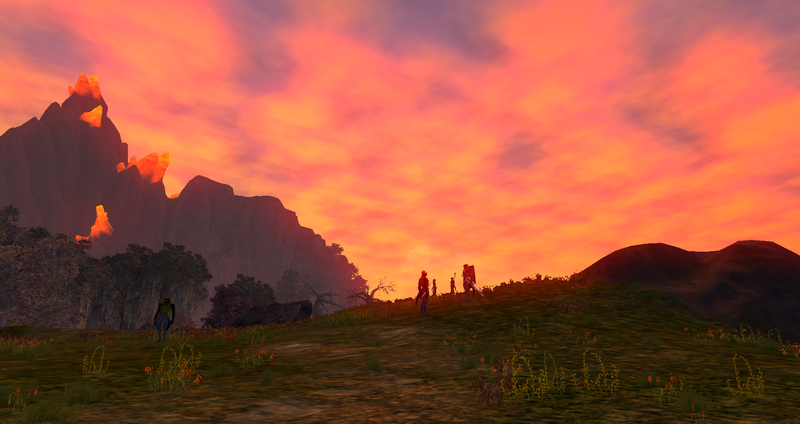 Stargrace's recent post on starting over in EverQuest for the umpteenth time very nearly lured me into doing the same. Just reading it sent waves of nostalgic desire rippling through the backwaters of my mind. 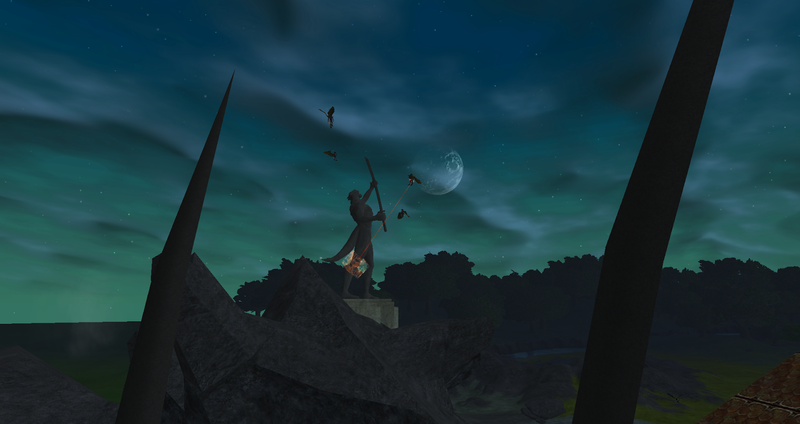 I haven't been keeping up with progress on Phinagel, the latest of EQ's many "progression" servers. As far as I can tell there are three currently up and running - Phinagel, Ragefire and Lockjaw. I think I have a character on Ragefire but an All Access subscription is required to play there so it's a moot point right now. I definitely had characters on the first Progression server, which was called The Combine and launched all the way back in 2006, at least according to this thread on the forums. Apparently The Combine eventually merged with Druzzil Ro, which itself was later merged into Xegony so I guess I have a level ten on Xegony now. Go me! The history of EQ server merges is fascinating - or it is if you lived through it. The list in this thread, itself from 2012 and now archived, so presumably already out of date, tells a story all by itself. The first server I ever played on was Prexus, which I picked because it had a name I found easy to remember. 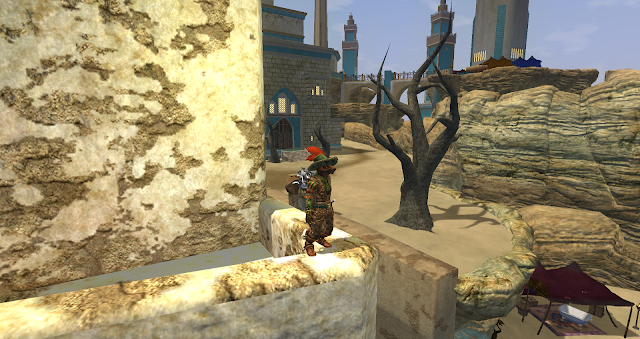 Mrs Bhagpuss joined me there and, as far as I recall, stayed while I wandered, first trying Brell Serilis (supposedly the unofficial RP server) and Test (just prior to The Great Wipe) before settling down for a long spell on Luclin, where I still mostly play - when I play. For the first four years EverQuest was in a state of continual and rapid growth - not just geographically, with the annual and bi-annual expansions, but in its ever-increasing population. Server capacity back then was a lot less than it would be later on and new servers seemed to open every few months. There's little in the hobby to beat the first few days of a brand new server for sheer, often near-hysterical, excitement, so I developed the habit of making a character on every server as it arrived. I remember making characters on Tholuxe Paells, Maelin Starpyre, Morell-Thule, Stromm, Morden Rasp, The Seventh Hammer, and Lanys T'Vyl on the first day they appeared. Probably there are more that I've forgotten. Some of those characters got played a lot, even if they never leveled very far. 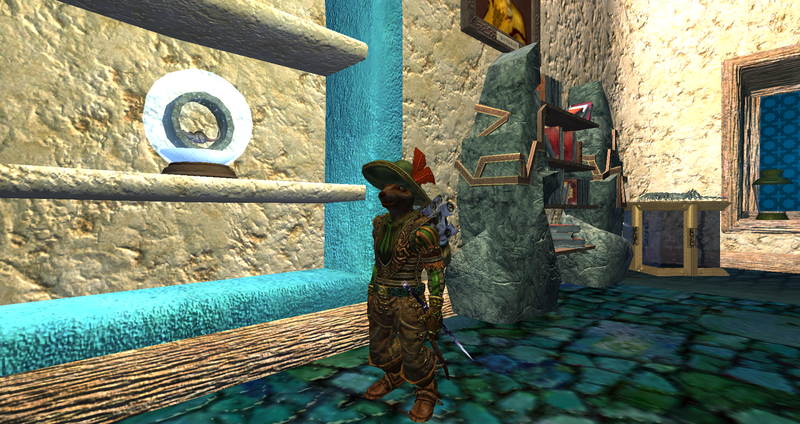 Morell-Thule was where I made my Iksar SK at the launch of EQ's first expansion, Ruins of Kunark. 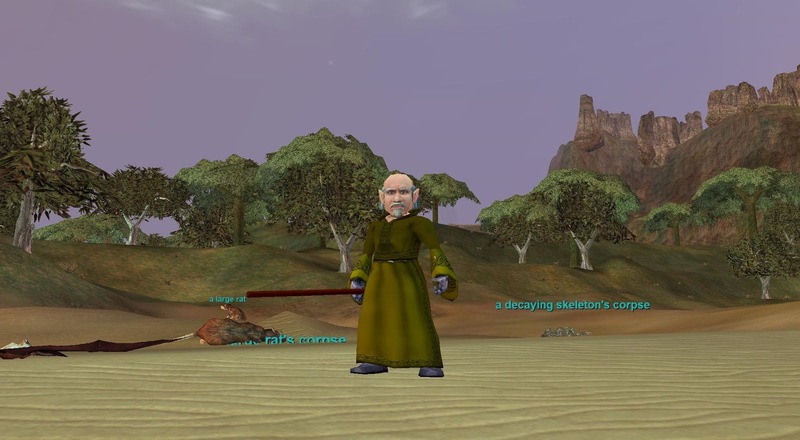 He was possibly the hardest and slowest EQ character to level I ever had, what with the Iksar XP penalty and the unforgiving Kunark starting zones. I spent more time getting lost in Cabilis than I did killing things. I still get him out and do a bit on him now and again. He's in South Ro these days, somewhere in the high teens, I think. I made a female halfling Warrior on Tholuxe Paells specifically to play with someone whose name I've long forgotten. They promised to start over there and duo with me and I made a warrior specifically for that - then they promptly left after the first week, never to be seen again. Right after that happened I got into an argument with someone else, which I resolved by logging out and not coming back for six months. That was my Tholuxe Paells experience in a nutshell, although I went on logging that warrior in, on and off, for years. Don't think she ever made double figures. Lanys T'Vyl and Luclin started on the same day and I made characters on both - a Druid on Luclin and a Wizard on Lanys. Like the warrior, the wizard had the occasional run out, often on a weekend morning for some reason, for the best part of a decade, without ever really making any progress. It was the druid that stuck. She became my most played and highest level character, eventually making it to 60 when sixty was the cap. Her career pretty much crashed and burned with the launch of the first European server, Antonius Bayle. For reasons that I no longer remember, Mrs Bhagpuss and I both began playing there, although not immediately. It was the first time we really played together, by which I mean in being in the same guild (and more importantly the same custom chat channel that operated as a supra-guild entity). For the first time we were sharing the same friends list, rather than duoing or joining ad hoc groups together, which we'd done on and off all along and Ant Bayle became our home for what seems to me, only in retrospect like my first, real, core run through Norrath. It was there that I finally had characters at the cap for two or three expansion cycles and when I mainly played in groups, in dungeons, rather than solo, above ground. It was there that I learned to play the game and not just to live in the world. charger). We had moved our characters from Ant Bayle to Saryrn on a free transfer before we left. Why was there a free transfer? I can't remember. Something must have merged with something or maybe it was when SOE and UbiSoft parted company. Anyway, we declined to pick them up again, choosing instead to go back to Stromm, where we'd both played at server launch, made friends, joined guilds and had good memories. We had another good run there, possibly two. I think we came back yet again after Vanguard. It gets very hard to reconstruct the sequence as time passes. The past fractures into a series of vignettes and incidents which, as I retell them, polish up like semi-precious stones into anecdotes, all the grit and edge smoothed down to a comfortable glow. It's also surprisingly hard to dig out simple facts like the launch dates of individual servers. Not impossible - it's all somewhere in the official patch notes, all of which are still available online. It's just more trouble than I feel like taking for a rambling, nostalgia-inspired blog post. Going back to Stargrace, it's astonishing how powerful certain triggers remain despite the drift and shadow of the passing years. She talks about her troll shaman making her way to North Karana to take the Spires to The Nexus on Luclin (the moon, not the server) so as to bind in that advantageous location, only to be killed in one hit by a passing guard as she waited for the twenty minute teleportation cycle to turn. That one tale combines a wealth of experiences for me. I walked a troll shaman to the gates of Qeynos to get him bound there out of range of the guards so as to have a better place to hunt than the swamps of Innothule. One of the scariest in-game things I ever did and one of the most satisfying when it turned out successfully. 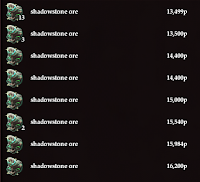 I hung back out of range of the guards at the North Karana portal as an Ogre Shadowknight, praying I was far enough back to stay out of aggro range. 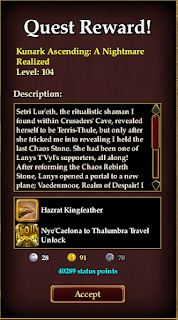 Several of my characters made more or less dangerous journeys to The Nexus to bind in what was the premier travel hub of Norrath until the Plane of Knowledge rendered it redundant overnight. When Stargrace goes on to talk about finding a heavy iron ulak in the Bazaar I can see the same icon in my mind's eye as if it had popped up on a vendor in front of me. She doesn't need to explain that the "PC" where everyone had been getting xp stands for "Paludal Caverns" - I can hear the screams and laughter echoing through that hideous place as though I'd spent all last night there - again! In layers of irony spread thick and deep, I was pondering the feasibility of fitting in yet another return to Norrath, this time to one of my very favorite times and places, the Luclin Era, while working through a series of crafting quests in Butcherblock on Stormhold, the EQ2 Time Limited Expansion server. Living in the past while living in the past. So Luclin will have to wait. Probably. This time. We'll see. Never say never again and home is where if you have to go there they have to take you in and all that. 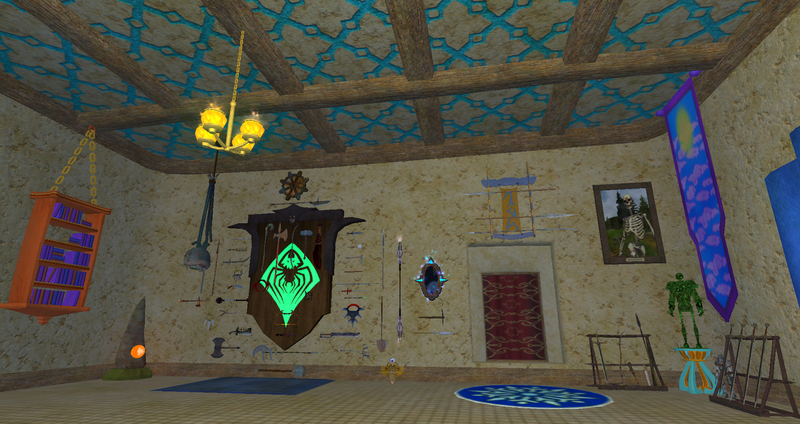 And Norrath is home. All of it. Always was, always will be. As is generally the way of things when news editors are involved, the only headlines DBG saw yesterday concerned a couple of bugs in the latest update. I'm sure the disappearance of the Signature Questline reward set a few pulses racing but it was swiftly addressed - no rollback necessary. Far more worthy of comment in my opinion is the ongoing effort DBG's EQ2 team consistently maintains in order not only to keep the game ticking along but to make sure it's continually growing. 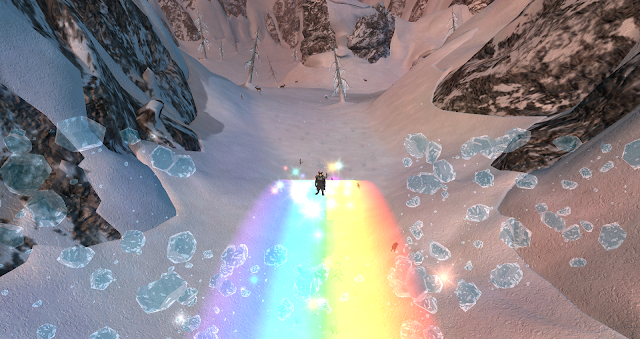 We've just had what I consider to be an excellent expansion and yet, before the paint is dry, here comes Frostfell. 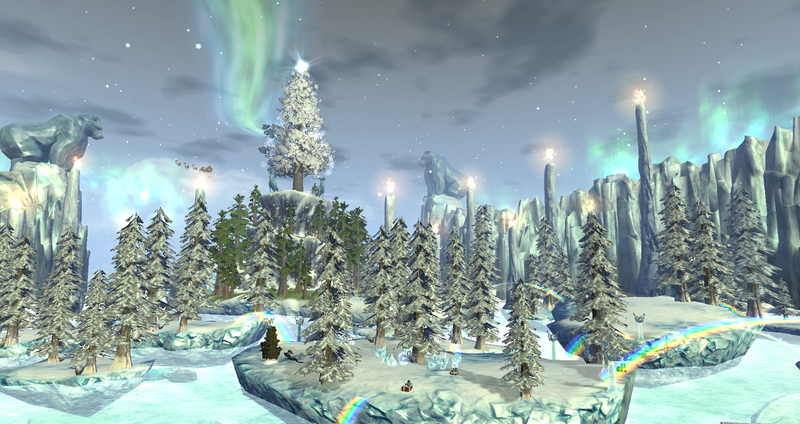 Of course, every MMO - quite possibly literally every MMO - will be putting up some sort of mid-winter festival this month. I happened upon a swarm of Grimps over in Qeynos Hills when I popped into the original EverQuest to take a few screenshots and Tyria will begin the Wintersday celebrations next week. It's a racing certainty that everyone reading this will see some kind of snow-related event in his or her MMO of choice within a matter of days. Frostfell remains my favorite nonetheless. I can vividly remember the excitement when the Frostfell Wonderland Village first opened its wardrobe doors way back in 2006. The times we spent there, fighting over present spawns or running the Icy Keep instance over and over and over for Eci tokens. 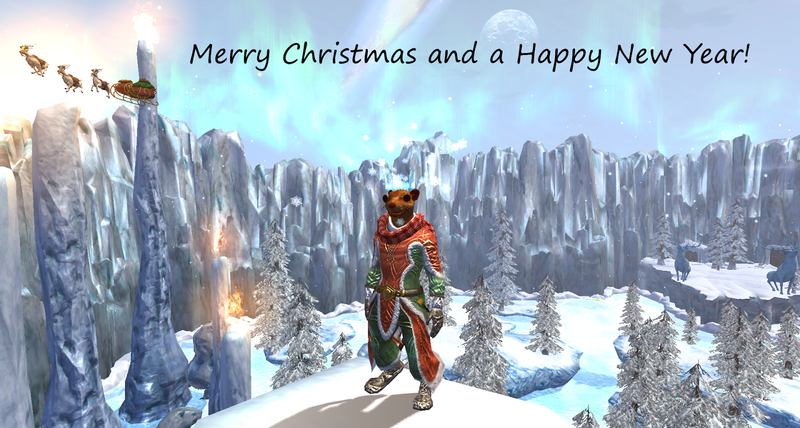 The Christmases we spent running through half-finished quest chains on Test. 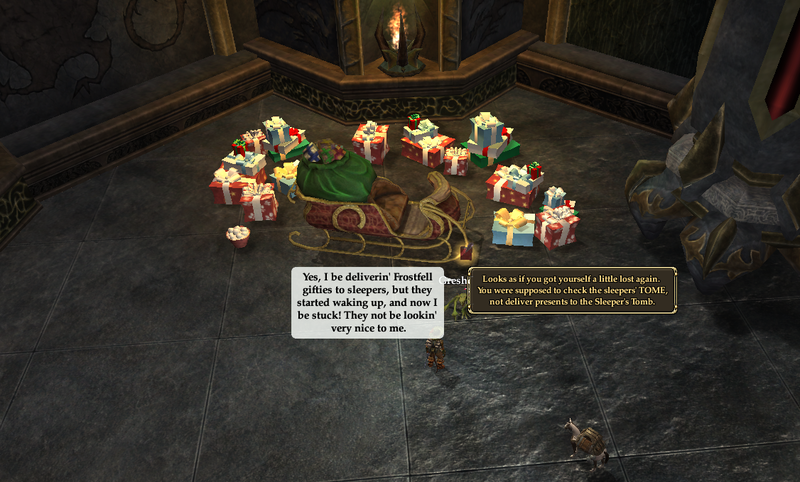 The goblins, the gifts, the bad puns. Happy days! Year in, year out Santa Glug's Goblin Helpers SOE developers and designers went above and beyond the call of duty, adding new quests, new presents, new crafting recipes, new house items and new gear every year without fail. In 2013 the zone got a complete makeover and it looks fantastic. The transition to DBG may have reduced the budget but the Frostfell Spirit remains undimmed. This year, yet again, we got a full, new quest in addition to three new books of recipes, seven new gifts, and more besides. Playing GW2 as I have been these past four years, where ANet profess to make an actual virtue out of leaving holiday events unchanged, (if, that is, they don't remove them entirely), I am acutely aware of the exceptional efforts of Holly "Windstalker" Longdale's small but dedicated crew. The new quest, which I completed last night, is excellent. A fun romp through a repurposed Sleeper's Tomb involving plenty of snowballs, it's straightforward enough that I was able to complete it without reference to the wiki. Just as well, since when I checked afterwards to see if I'd missed anything I found no-one had written it up yet. The rewards are excellent - if you like housing as much as Syp or I do. I was spoilt for choice between the two icy gargoyle models but in the end I chose the one that didn't look like it was about to bite my head off. With that it was off to my Maj'Dul mansion to find somewhere to put it, along with the rat in a snowglobe given to me by Santa Glug. 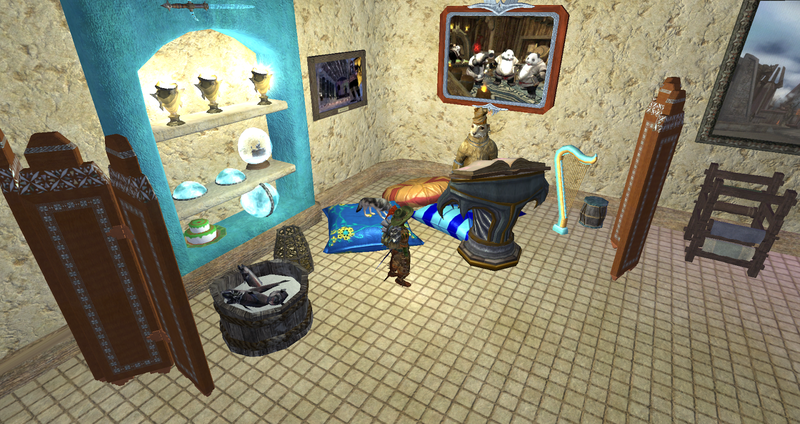 My ratonga's is house is now so full of junk treasures that it takes up to thirty seconds to load every time I zone in. I really should think about using one of the several Prestige houses I've acquired over the years to take some of the overspill but somehow that place is home. It was a lot of hard work getting the faction to buy it and I can't really imagine living anywhere else. The other big Frostfell news is that the festival is coming to the TLE Stormhold server for the first time. That is very definitely enough to get me to log my SK there in and spend some time in the Village. I also took advantage of the free transfer token offered to everyone on the now-redundant Race to Trakanon server, which closes in the New Year, that race having been won by...someone. I moved my mid-teens Bruiser to Skyfire and he may be the one to get the benefit of the Level 100 Boost that came with Kunark Ascending. I did play a max-level Bruiser regularly back when the cap was 90 so I feel reasonably confident I'd get the hang of it again. He deserves some Frostfell fun too. In the old days, when EQ2 was my main game, I'd have seen so much of Frostfell by the end of December I'd be almost as keen to see it go as I was to see it arrive. These days my concern is more over how I'm going to fit in all the things I want to do over the holidays in both Tyria and Norrath. I guess I'd better get on with it instead of sitting here chatting! And look what Santa Glug had for me today! 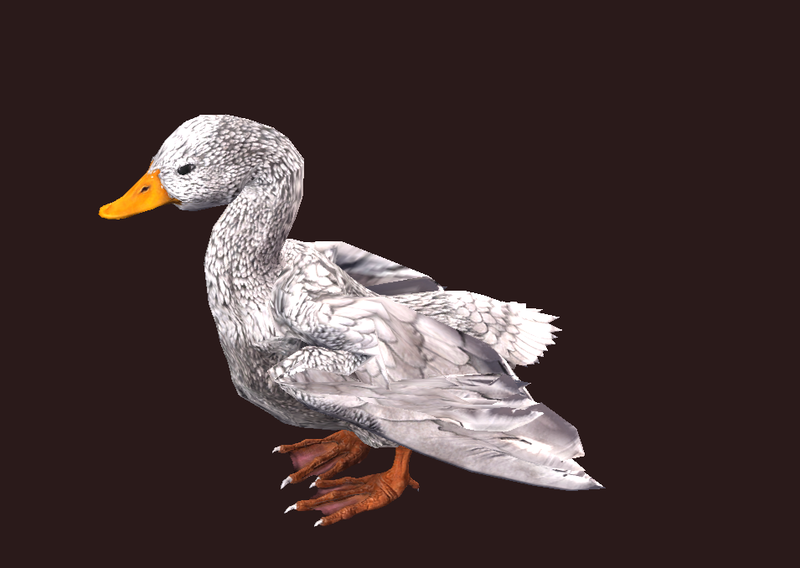 This fantastic "Alabaster Pekin" house pet! Just what I wanted!